The research activities and outcomes as well as news items are within each of the themes below. Lindsay-Smith, G., O'Sullivan, G., Eime, R., Harvey, J., van uffelen, J. (2018). A mixed methods case study exploring the impact of membership of a multi-activity, multicentre community group on social wellbeing of older adults. BMC Geriatrics. 18:226. How healthy is Australian Sport? Eime, R., Harvey, J. 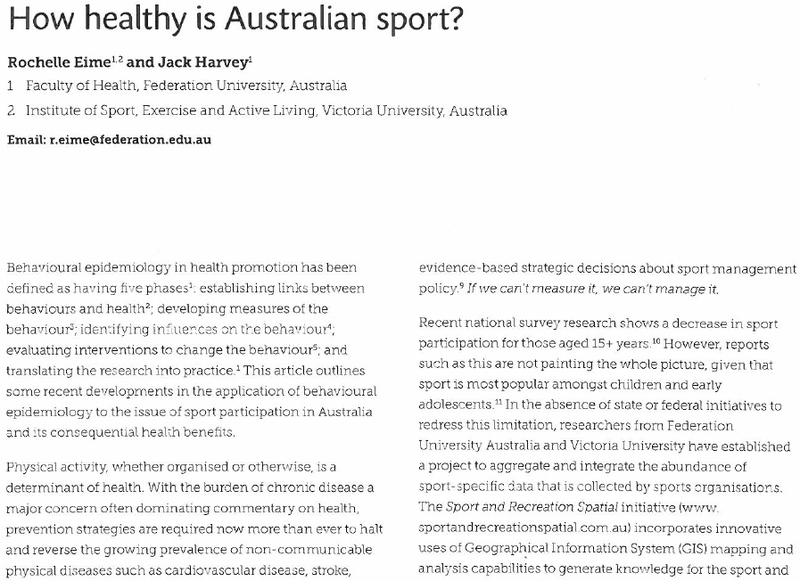 (2015) How healthy is Australian sport?. Australiasian Epidemiologist. August. 22(1) 9-10. Eime, RM., Harvey, JT., Charity, MJ., Casey, MM., van Uffelen, JGZ., Payne, WR. 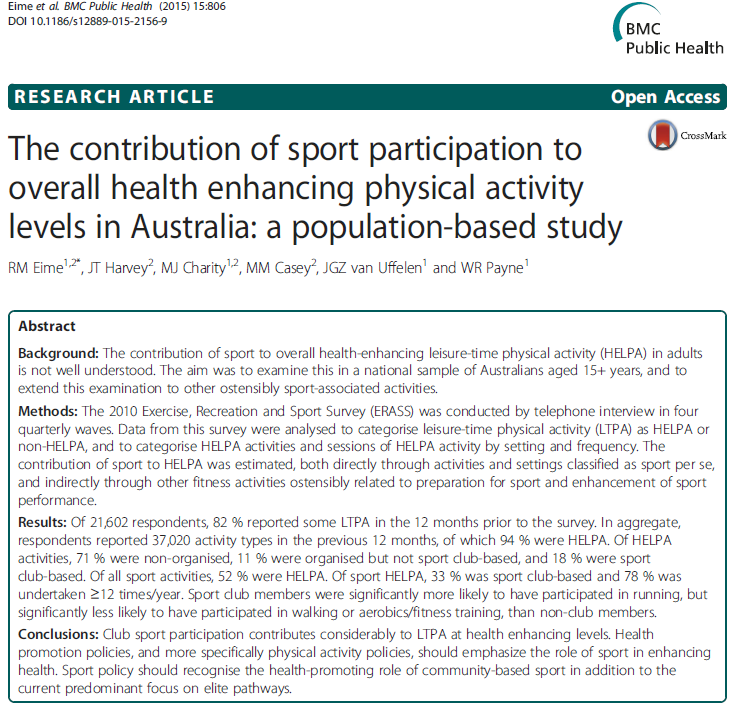 The contribution of sport participatoin to overall health enhancing physical activity levels in Australia: a population-based study. BMC Public Health. 2015. 15:806. Eime R., Young, J., Harvey, J., Charity, M., Payne, W. (2013). 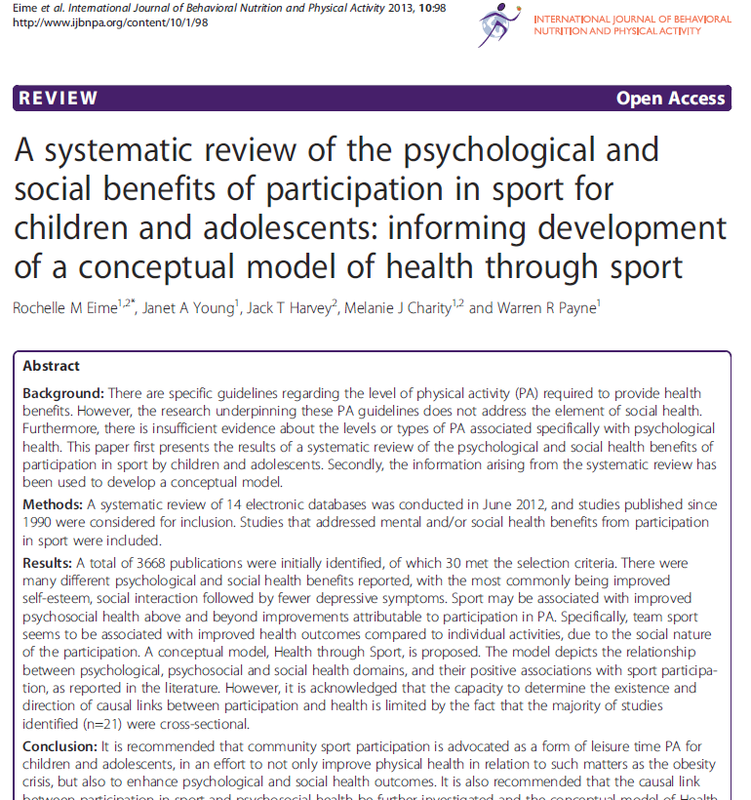 A systematic review of the psychological and social benefits of participation in sport for children and adolescents: Informing development of a conceptual model of Health through Sport. International Journal of Behavioral Nutrition and Physical Activity. 10(98). Craike, M., Symons, C., Eime, R., Harvey, J., Payne W. The influence of physical activity behaviour regulation on physical activity and perceived health for adolescent females. In Press. Journal of Physical Activity and Health. This is an abstract of an article to be published. Eime, R., Harvey, J., Payne, W. Dose-response of Women’s Health-Related Quality of Life (HRQoL) and Life Satisfaction to Physical Activity. In Press. Journal of Physical Activity and Health. 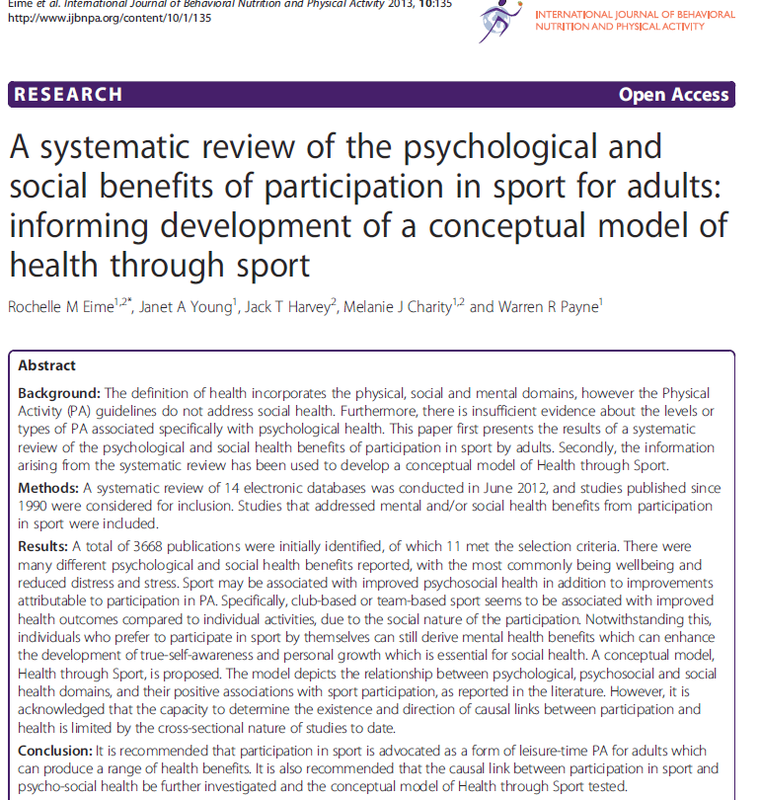 Eime, R., Harvey, J.H., Brown W.J., Payne, W.R. (2010) Does sports club participation contribute to Health-Related Quality of Life? Medicine and Science in Sports and Exercise. 42(5). 1022-1028. Eime, R., Payne, W., Harvey, J. 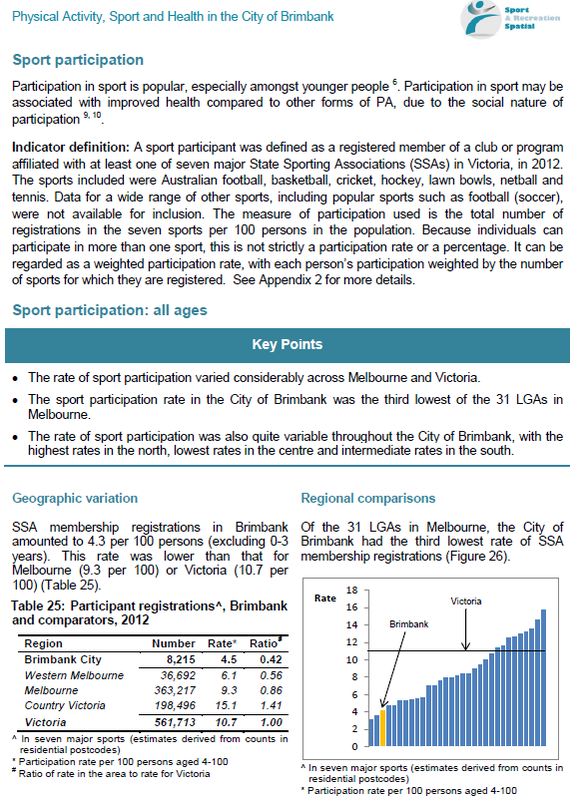 (2008) Making sporting clubs healthy and welcoming environments: A strategy to increase participation. Journal of Science and Medicine in Sport (11) 146-154.